Tim Fite tonight on WHFR! 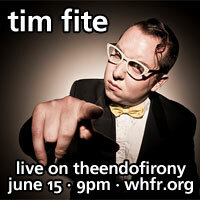 Tim Fite will be stopping by theendofirony's show on WHFR tonight! The one-of-a-kind performer is sure to please everyone listening, so be sure to tune in tonight at 9PM ET at www.whfr.org!